If you use a gammon on the bone, you'll have the bone left for soup. But a boned gammon will taste just as good. Preheat the oven to 180°C, gas mark 4. Lay a large piece of foil in a roasting tin. Put the gammon on top, rind up. Bring the foil up around it and crimp the edges together to enclose the meat. Don't wrap it too tightly. Roast for 25 minutes per 500g. Remove from the oven. Increase the heat to 200°C, gas mark 6. Cut the rind and string from the gammon, leaving the fat. Score the fat in a diamond pattern using a sharp knife. Mix the honey, sherry and sugar and spoon over the fat. 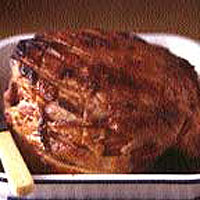 Bake for 20 minutes or until golden brown, leaving the sides of the meat protected by foil, but the top open. Leave to cool, then carve.